Ask fellow campers about "Umatilla Marina and RV Park" and nearby attractions. It is an easy on and off of the interstate, the sites are easy to get into and the view of the river is great. We stay here on our way south and on our way back home, satellite friendly and free wifi. We camped at Umatilla Marina and RV Park in a Fifth Wheel. Pick the low number sites on the outside they have a lovely view of the river. Nice park. Electric was good. wanted 50 amp but only had 30. Did not hook up water but it said it was very high pressure. Pretty level spots. Easy in and out. Grass beside spots. I would stay again. We camped at Umatilla Marina and RV Park in a Motorhome. We stay here often. It is a public park and all the sites have good spacing. There is access to the river. The sites and roads are gravel and easy to get in or out. There are pull throughs and back in's. The staff is very good and helpful and the park is well maintained. The only downside is they have only a few 50 amp sites, the rest are 30 amp but the power is good through out the park. We camped at Umatilla Marina and RV Park in a Fifth Wheel. The park is on the river. The spaces long and wide all gravel with grass between the sites and in an open area. The back-ins are angled and easy to get into pull thrus are long. We like this park and stay as often and we can when in the area. We camped at Umatilla Marina and RV Park in a Fifth Wheel. Nice parking as described by others...fun to watch boaters on river and walk around marina and grassy swimming area (sometimes filled with weeds, sometimes swimable) Near freeway but I didn't hear them. Very quiet... You can make a reservation ahead of time. Site 1-5 (approximately) are pull thrus and give you a view of the river. Might want to shop ahead of time. We camped at Umatilla Marina and RV Park in a Motorhome. Prepare for dust. Driveways and site pads are dust and gravel. We arrived with a freshly washed motorhome and left dust covered. It doesn't help that some of our fellow RVers drive through the park as if they are being chased by bill collectors. I know this is a city facility but do something about the dust. Otherwise, this is an OK park with some shade trees and nice views of the Columbia River. There are back-in and pull-along sites which are pull-through that run parallel to the driveway. We had full hookups with 30amp electric. Bathrooms are a little rustic but decent. The WiFi was reliable and good speed. We paid $30.71 per night with Good Sam discount. We camped at Umatilla Marina and RV Park in a Motorhome. The park is a part of the Umatilla Port and had a marina and park with a boat ramp associated wit the park. The people are very friendly and appreciative of your business. The sites are long and wide. All the sites are gravel with grass areas all around the park. The pull throughs are on the sides and the back in's are in the center area. All easy to get into. It is located along the Columbia River, giving you lots of views. This is our favorite place in this area. We camped at Umatilla Marina and RV Park in a Fifth Wheel. I was a little concerned when we arrived and no one was at the office and it was locked but one of the other campers was quite helpful and pointed us in the direction of our site. When I made the reservation, the host had given me the site number so I at least knew what site I was looking for. It was a pull through over looking the Columbia River and marina. As we were pulling into the site, the host arrived and confirmed we had the right site, thank goodness. The pull through sites along the river are along the edge and all lengthwise, forming a long line rather than side by side. The site was gravel/dirt and it was dusty but they hadn't had any rain for a long time. Unfortunately the wildfires of the northwest caused the visibility to be reduced and it was over 100 so it wasn't the best time to be in the area but no fault of the rv park. We appreciated the shade at the site and sat out and watched the boats on the river. It isn't a very big park but kept very clean and the services worked well. The price was very reasonable and we would stay there again if in the area. One note, the traffic patterns getting to the rv park are challenging and require making a turn and getting into another lane where traffic seems to bottleneck. We camped at Umatilla Marina and RV Park in a Fifth Wheel. There is a nice grocery store in Umatilla and all kinds of eateries a short distance away in Hermiston. Shop around for fuel as the prices vary in the area. There is a nice park a short distance away, below the rv park where you can take the dog down to the river to swim. Excellent park. It is not directly on the water, there is a parking lot between the campground and the little marina, but the water is close. You can walk to the park for the swimming beach (small rocks and grass) and take your dog or go for a dip. The lady running it is very nice. Lots of space to maneuver your rig, back ins in the center circle and drive thrus on the outside circles. it is a good stopover and enjoyable to watch the many fishermen. We camped at Umatilla Marina and RV Park in a Motorhome. Park is on Columbia River at the Umatilla Marina. Lot of Grass. Office Staff very helpful. Easy on and off highway. Can be windy. We had long pull thru. Will stop again. We camped at Umatilla Marina and RV Park in a Fifth Wheel. Park roads are gravel and in good condition. Our site was a level gravel back-in with a nice concrete picnic table, fire ring, and shade tree. Perimeter sites are mainly pull-through and interior sites are back-in. There are only six Columbia River view sites with 50 Amp service so reserve well in advance for these spots, it was in the nineties during our stay and could only run front AC . Office manager was friendly and efficient. All utilities worked fine. No cable TV, but plenty of network stations off the antenna. Wi-Fi very strong and AT&T works well. 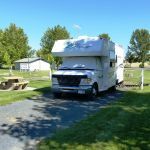 We camped at Umatilla Marina and RV Park in a Motorhome. This park is a municipal park and not a fancy park. but well maintained and big sites great views of the Columbia river. We enjoy just relaxing at his park. The staff is very good and accommodating. The road are all gravel as are the sites. The Wifi was good this time (has been poor in the past). The sites are wide. Great inexpensive place to see the area. We camped at Umatilla Marina and RV Park in a Fifth Wheel. Campground is in great shape. Sites are level and plenty big for your big rig and a toad. Lots of areas to walk your dog and enjoy the Columbia River. Hook-ups are located in the proper place and all worked great. This is a gem of a campground. We camped here in a 40' motorhome. We camped at Umatilla Marina and RV Park in a Motorhome. We always like to stay here The sites are wide and long both the back-ins and pull through. The park is well maintained and very nice staff. There is some traffic noise but not enough to offset the positives. The views of the Columbia and marina. Great place to relax and watch the river. We camped at Umatilla Marina and RV Park in a Fifth Wheel. Stopped here for an overnight because almost all the other parks in the area were full. Other than being a little off the beaten path, the facilities were great. Plenty of trees, site was level, wifi worked well, over the air TV was adequate, restrooms and showers were clean and the park was well maintained. We'd definitely stay here again. We camped at Umatilla Marina and RV Park in a Travel Trailer. We were just passing through, but this would be an excellent base for boating on the Columbia River. Most of the other campers here had boats. Near boat ramp for fishing, jet skis. Site 1 - 6 have excellent views. The truck stop up the hill has the best food. Are you affiliated with Umatilla Marina and RV Park ?